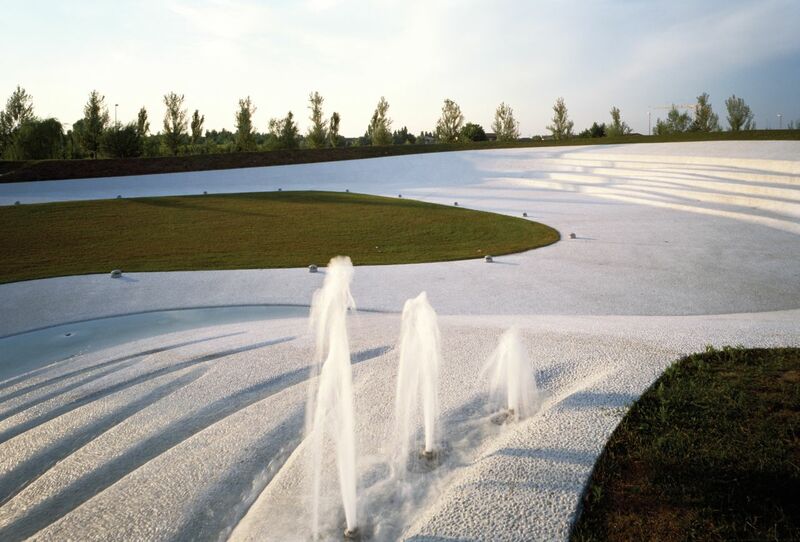 An anonymous empty lot in a new residential development is solved with a simple gesture, an earth green mound which screens a central green space and meanders to create different occasions for recreation: an open-air amphitheatre, a children’s playground, a cluster of benches, a picnic shaded spot, a small artificial waterfall. 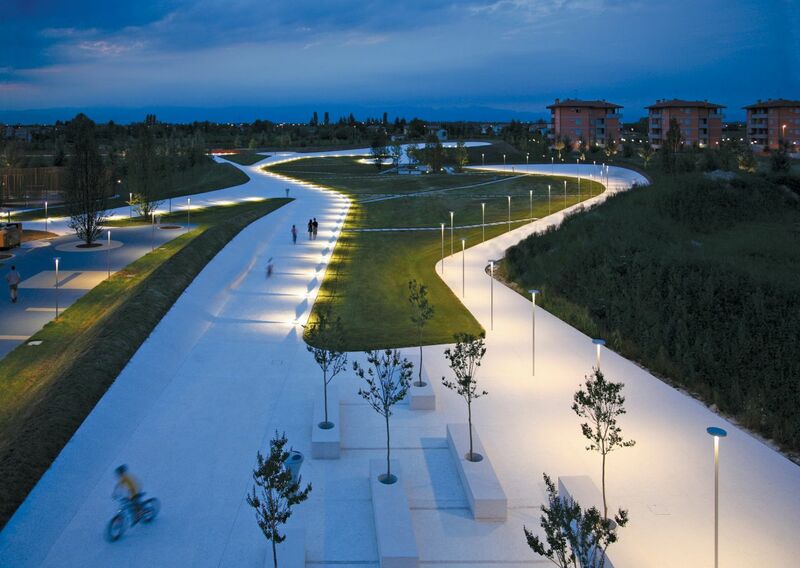 The public commission by the city of San Donà di Piave to design a small neighbourhood park was the occasion to experiment on the theme of a contemporary public space in this “middle landscape”. 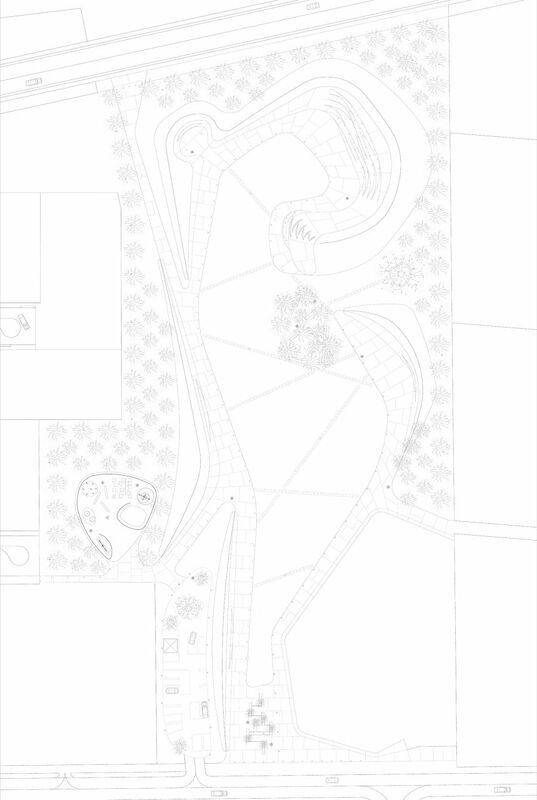 The initial data were somehow discouraging; a poor design of the new street network, mediocre architectural solution for the houses, little or no public services to animate the new space, but more than that the strongly “residual” character of the plot assigned to the park, with little public accessibility and cut off from the main street by a planned parking lot. The shape of the given plot surrounded by two-to-four floors high houses has been redesigned to open it up to the south toward the main street. 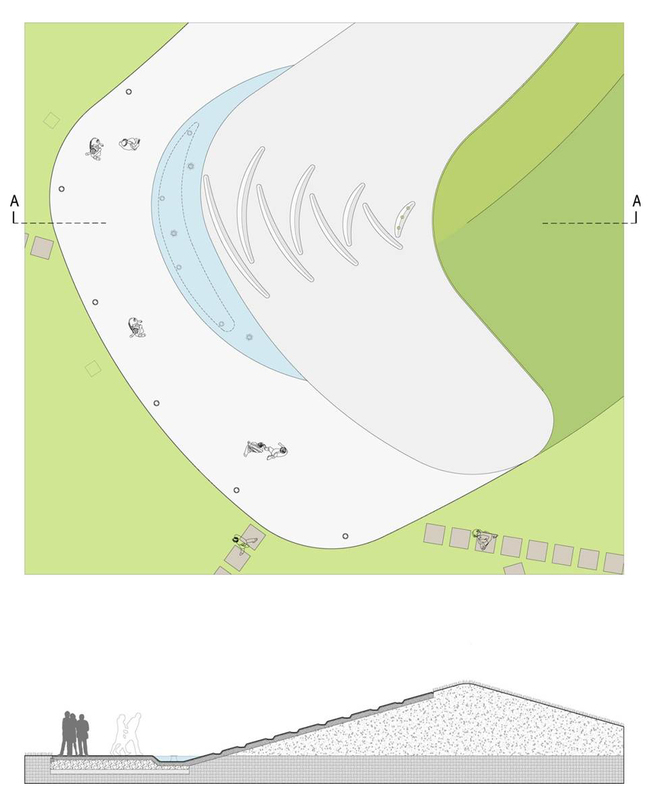 Next to this main access, the planned parking has been turned ninety degrees to form a bean-shaped surface paved in brightly coloured asphalt and screened by an earth dune recalling the river dams of the context. 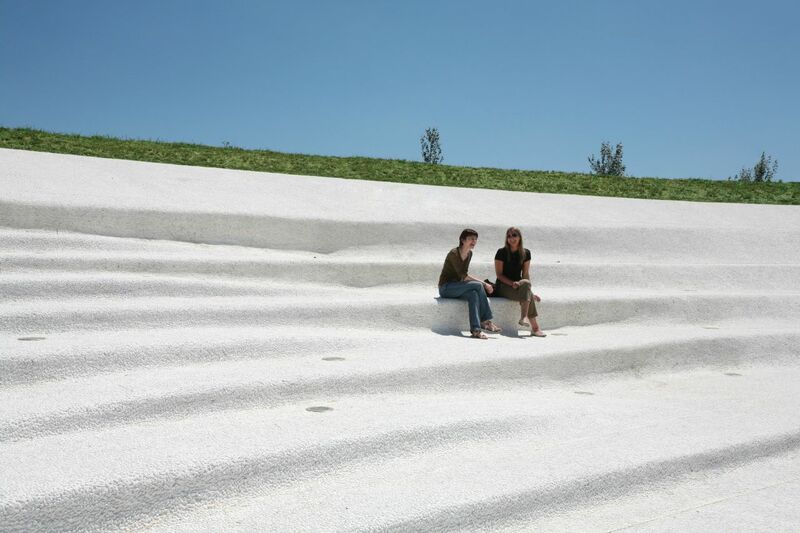 A main hard surface of small white pebbles cast in white concrete unifies the pedestrian paths, deforming its width, shape and level to become in turn a seat, an open-air auditorium, a fountain, a gathering place for kids, a bicycle route, a picnic spot. 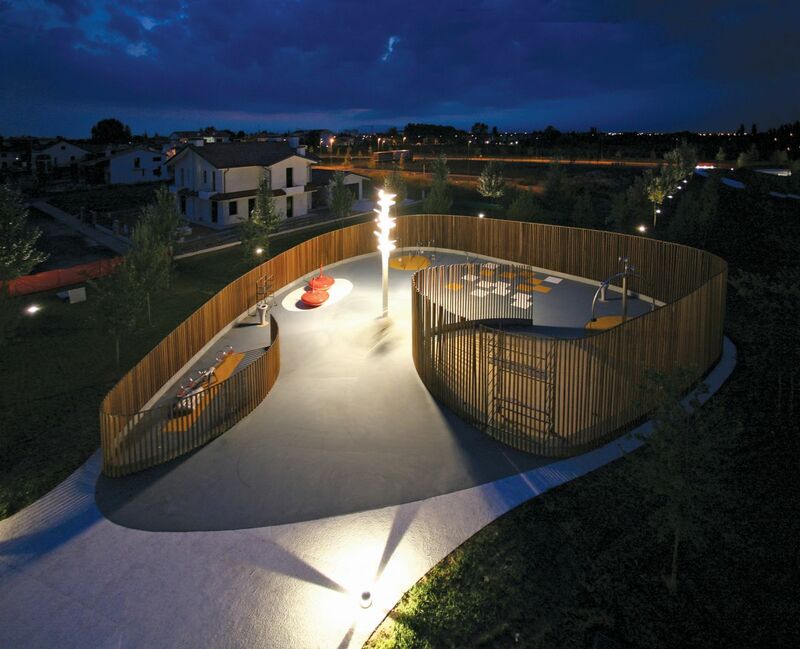 A spiralling wooden screen shelters a playground lit by a high lamp pole in the shape of a sprout. 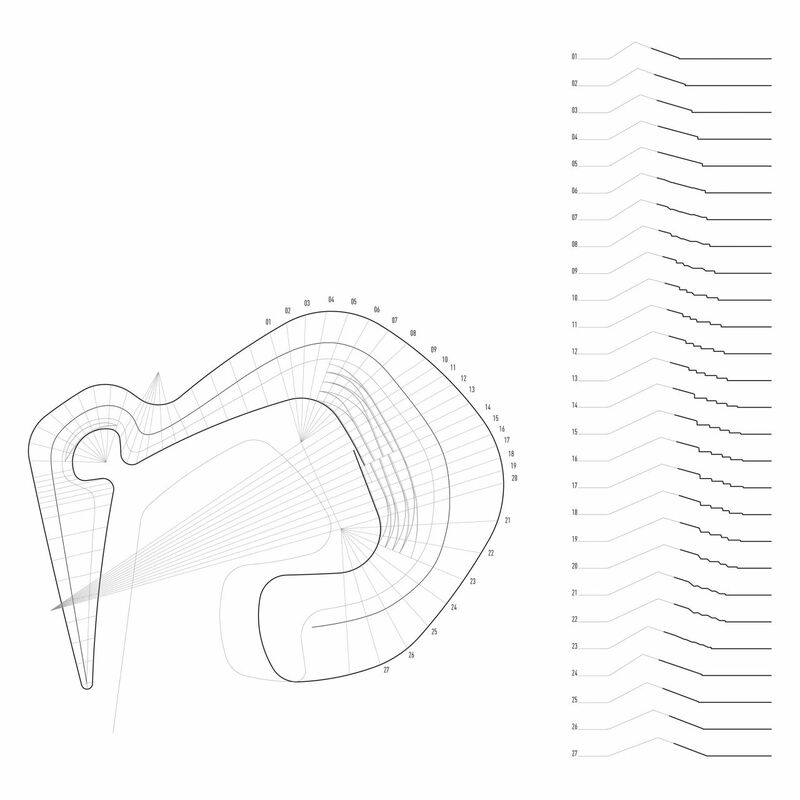 A series of “ripples” in the concave higher slope act as an informal amphitheatre for events, and their central crossed height offset create a low-pitched ramp for wheelchairs. 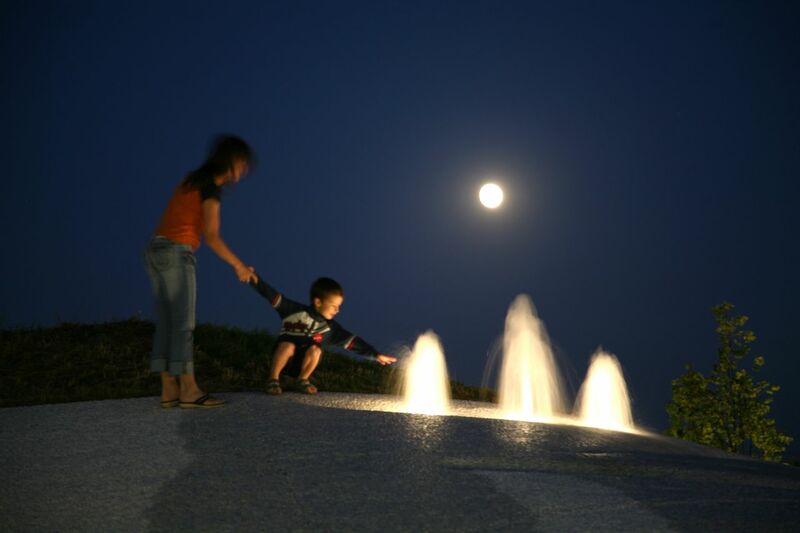 An artificial water spring – with time-planned intensity differences in the strength and volume of the stream at half hour intervals – cascades down from the higher mound through a series of slits to a moon-shaped pool. 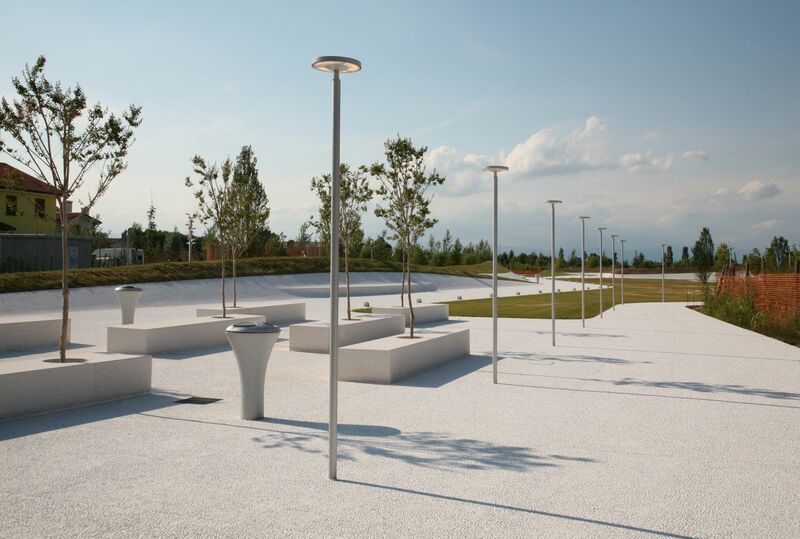 Trees, lighting fixtures and white stone benches pierced by tree pots help define the space and create different microclimates in the different seasons. 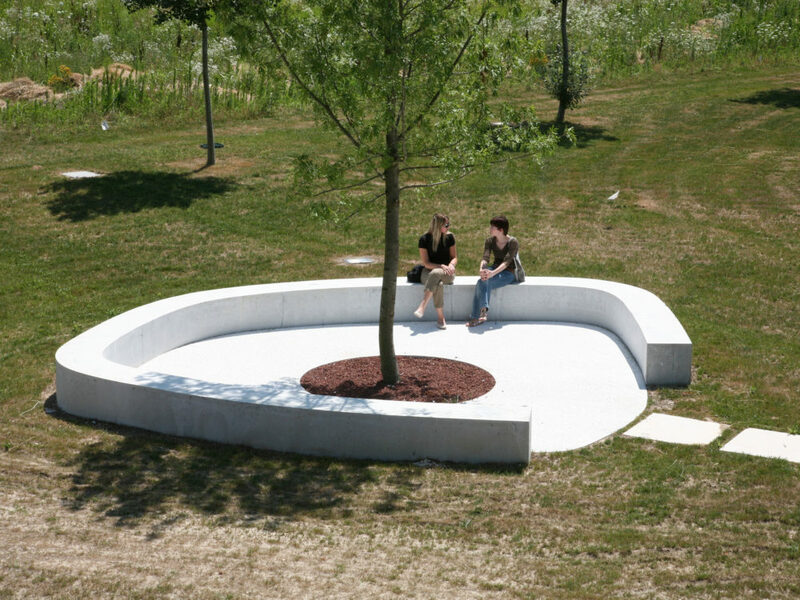 A central area next to a drinking water fountain is shaded by denser trees, offering a fresher spot in warm summers; a roughly circular concrete bench is bent around a single large oak tree to seat informal chats or picnics. 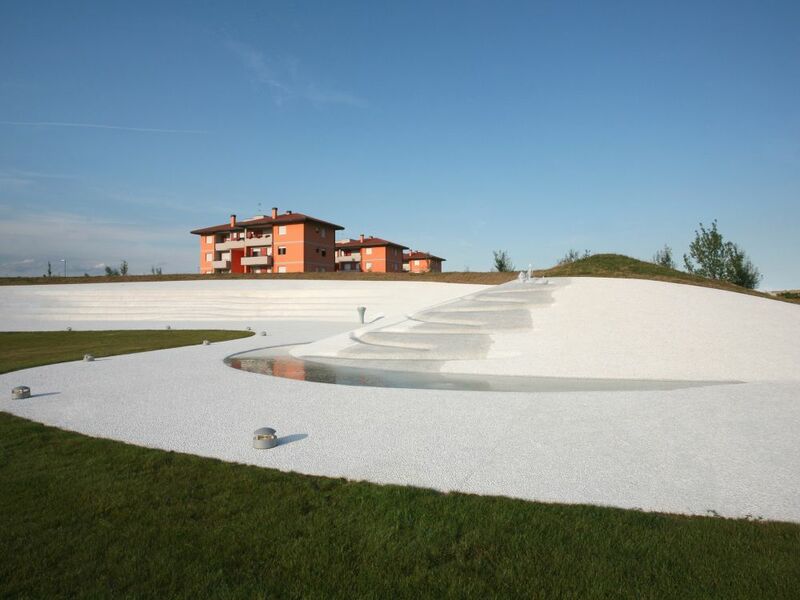 The height of the earth mounds which embrace the wide central meadow is studied to protect the space from the surrounding disorder but not to screen off the view from and to the houses. A number of radial paths connect the central space to the bike and pedestrian network which connects the neighbourhood to the larger city structure. 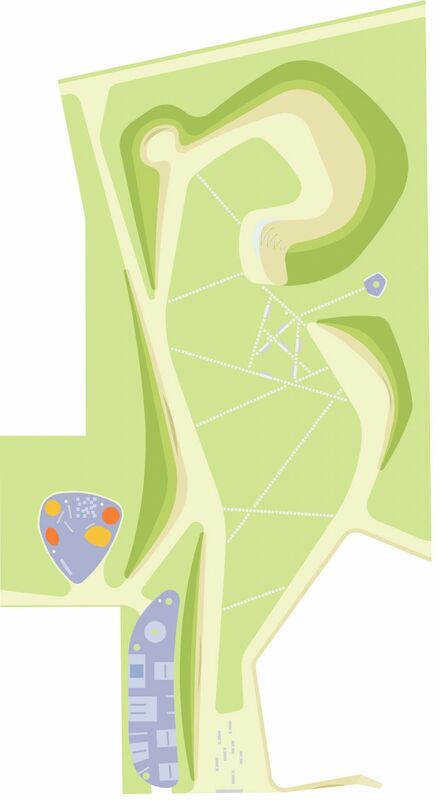 A continuous earthwork, rather than a number of separated “services”, respond to the few needs of “well-being” and leisure of a park, contributing to reduce the visual and spatial disorder of the suburban sprawl. The glaze from the white paving, quite strong in the sunniest days, slowly changes into coloured shades the different hours and seasons, amplifying the perception of natural events and weather changes as a large sundial or a landscape, reconciling the natural dimension with the daily city life. 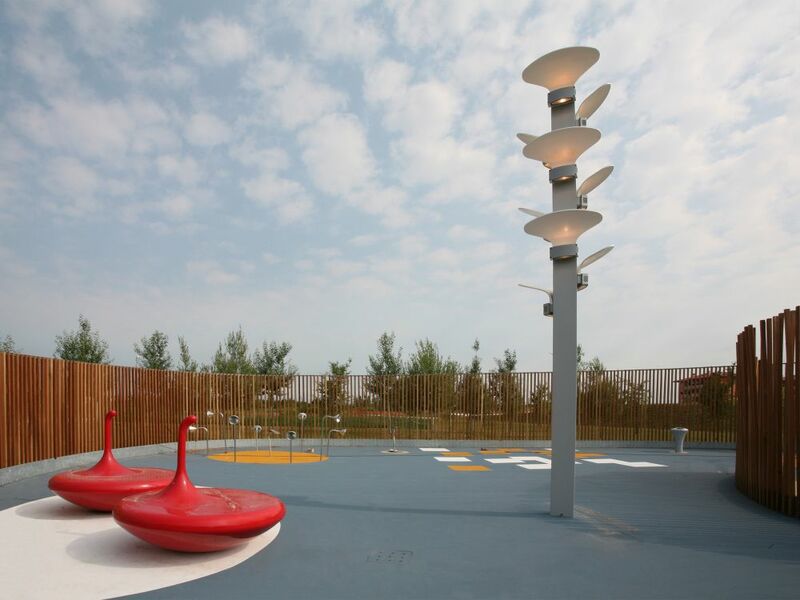 The evening light design amplifies the different character of the areas: an array of slender light poles follow the gentle curve of the paths, ground-level horizontal light points exaggerate the roughness of the paving surface, and the high light pole in the playground signals the park from the perimeter road. The park has already become a very lively meeting place at all hours, hosting relaxed newspaper readers as well as mountain bike acrobats, old ladies gossiping and youngsters playing guitar.